but with this law they could promote accurate guns; one hole group is cheaper! Dang, you guys get me every year !! Happy Easter and April fools on me ! Might be April Fools,but the fools in Cali are capable of anything these days. Good grief, don’t give these chuckleheads in California any ideas. They might actually do it. Unfortunately, I live in that state and there’s nothing to stop these militant activists who call themselves statesmen, unless and until the NSSF and or the NRA will step forward and take these cretins to the Supreme Court. Well played, Accurate Shooter, well played. had me for a moment. WHAT ???!!! April 1, thank goodness!! Is this a April fools joke. If not theres alot of people that need to have their heads examined. I didn’t see any provisions for that examination in the bill. How about a Tax collected by Federal T.S.A. agents to match any abridgment of the Second Amendment of Out bound Calif. residents. An executive order by Trump would do to start with. Patterning a shotgun will require a home equity loan. I am hoping that this is an April Fools joke? Is this real? How about you dumbasses vote these cretans out of office, otherwise you damn well deserve what you get. Hey, you’re gun owners. Do what has to be done or turn em in. Even though it is April 1, don’t give them any ideas!! It’s not that simple CJ. The two major voting blocks in this activist state are the SF bay area and the greater LA area. For the most part, the remainder of the state are patriotic Americans but those two bastions have all of the votes. Few hunters and few shooters outside of gang members. The Democrats are in power in all 3 areas of government and the vast majority of them come from those areas. The states of Washington and Oregon are similar and if these rules go unchecked, are sure to follow CA. Does this article have anything to do with the date? Does this tax apply to law enforcement? As goes the libtards of Kommiefornia, so declines Orenogun and Washifornia. The idiots in WA state cant think for themselves and our governor is, sadly, a liberal idiot! A liitle late for me -as in New Zealand, it’s April 2nd already. It looks like they are going to put the indoor shooting ranges out of business. Will law enforcement have to pay the tax too? I almost forwarded this until I thought about it for a minute. Good one. The indoor range I shot at today in Northridge CA, has begun installing cameras in each lane to record all hits on paper. When you leave your bill will be automatically charged to the credit card you use for the bullet hole deposit and your receipt will be ready for you. I think its tax deductible. Damn! He gets me every year. Thanks, Ed. P.S. 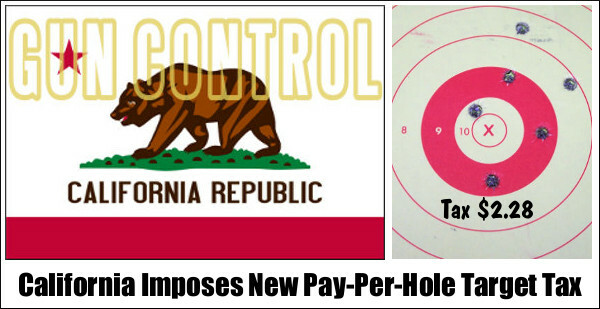 A per-hole tax is very unfair to people who can actually hit the target. It favors inaccurate guns and poor markmanship. of 2013, relating to human services. 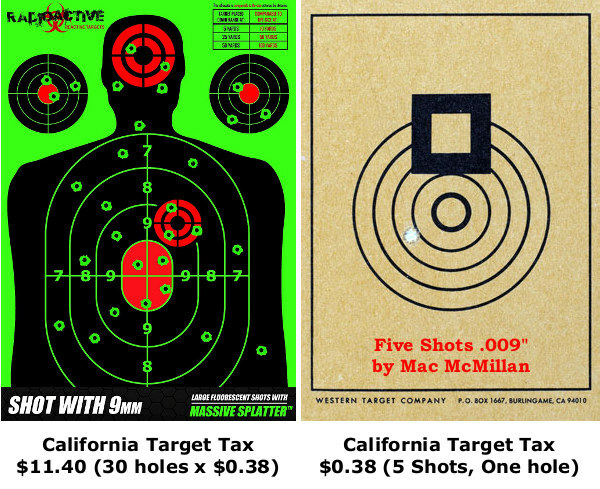 DIDN’T SEE ANYTHING ABOUT TARGETS . . . .
You forgot to mention that the new tax is progressive (like everything else in California). The $0.38 is for the hole in the 5 ring, every additional point increases the tax by 5 cents, so that the 10-ring would cost you $0.63 and the X-ring would be $0.65. Wait, so what if someone shoots steel reactive targets? 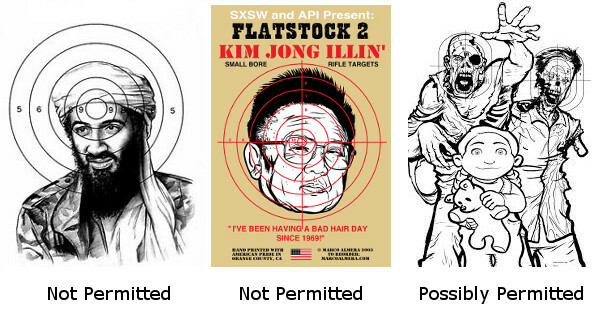 Paste a picture of the governor or state [legislators] over the target. Shoot it full of holes and have it scanned and submitted. This was friggin’ good one Accurateshooter !!! We had all better take a better look at this. A friend today searched this bill in CA and found it has nothing to do with a target tax. AB211 talks about nursing homes and welfare issues and has nothing to do with guns or shooting. Neither of us were able to find this subject in a search. Very curious where Accurate Shooter obtained this information…..
Come on guys. It is a great April Fools prank! You better be careful with these April fools jokes because you’re giving the A.G. crazies ideas. You just know there’s some governor somewhere with his finger tapping his chin saying you know… I never thought of that. Ok, I’ve been duked too. Living in California nothing can be taken lightly when it comes to our gun rights. I almost feel like it’s the 60’s and spaceships are landing on earth with little green men. I just hope that this one doesn’t come true eventually TOO !! Area 51 ? Not a nice “April Fools” joke. Californians are so shell shocked by the stuff this state passes it hurts much more than funny. Best April Fools Joke I have been a victim of in years. ~ Put “MoonBean’s” Picture on the Targets ……Then they would make a $$$ FORTUNE $$$$. Ha! And I was figuring that y’all were incorrect and the fee would actually be 30x.38¢+$5 DOJ target processing fee = $16.40. I was thanking God I didn’t live in Kali. Good one.